Does it mean there's no more NR? Mobage/Dena should have at least one more event so we can use all our items (sandstill, doriyaki, superduper, etc.). How do the ppl at DeNA live with themselves? I agreed with both of u. So now that the game is done, where are you guys moving to? My current game is Epic Heroes(new player) but if you guys have a game you've migrated to, I will, as they say, get it on. Hey chav! Good to see ya back in here! is epic heroes by locojoy? Yes, by Locojoy. Liking the MMO feel, for a card game. I just started a few days ago(9). Before that, I played Zombie Farm Battles but the game took a drastic change that old players like me felt cheated, we kinda moved to this game enmass. chavarlison wrote: Yes, by Locojoy. Liking the MMO feel, for a card game. I just started a few days ago(9). Before that, I played Zombie Farm Battles but the game took a drastic change that old players like me felt cheated, we kinda moved to this game enmass. Im liking epic heroes already! if u try paramon, make sure to join Oceania server and then go to Molooland. 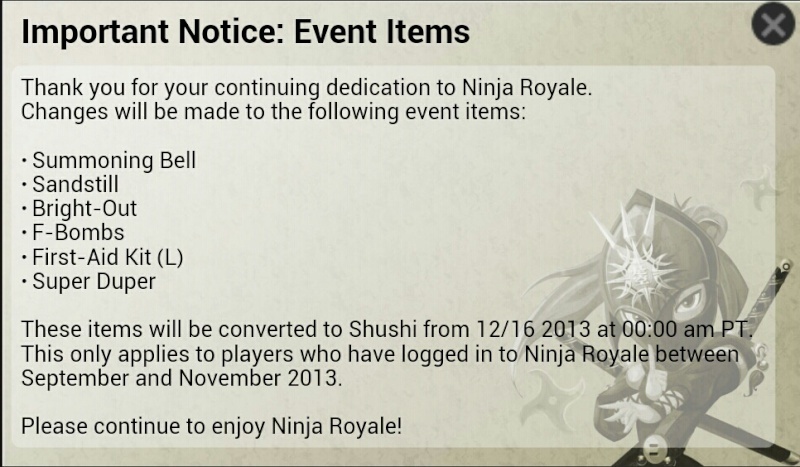 It doesn't look like there will be any events since they are converting all the premium items to sushi. And if there was to be one, there would have been one on already. I have 68 large dora's have 113 small ones and saved up on 400 bleu tokens. Bcuse i sweared to myself to catch first place in crackdown event. I feel CONNED i really do. But what is the real reason to stop? Is it bcuse they have reached the highest number of income and it will inflate if they keep going. Is it bcuse they are out of ideas ? Or is it hacking of moba/ koban. These questions leave me in doubt. All i want is some answers, then i can move on. Sounds silly bcuse it is a game. But i feel it matters. Anyone notice they the new date for paid services is jan 7th? Does that mean another event? Ill keep my fingers crossed! Kawayanii wrote: I have 68 large dora's have 113 small ones and saved up on 400 bleu tokens. Bcuse i sweared to myself to catch first place in crackdown event. I feel CONNED i really do. But what is the real reason to stop? Is it bcuse they have reached the highest number of income and it will inflate if they keep going. Is it bcuse they are out of ideas ? 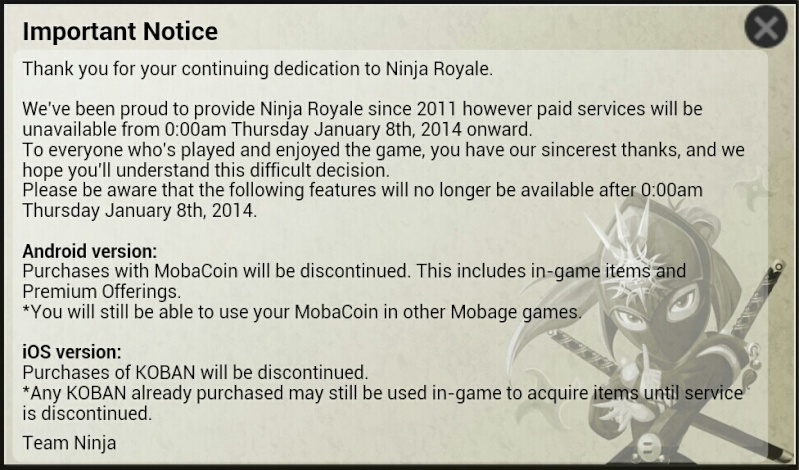 Or is it hacking of moba/ koban. These questions leave me in doubt. All i want is some answers, then i can move on. Sounds silly bcuse it is a game. But i feel it matters. I know how you feel. That's why I'm glad I quit before all this happened. And I somehow KNEW this was going to happen VERY soon. But there is absolutely nothing we can do. All the virtual pixels and stuff belong to the DeNA company and they can give it or take it away whenever they want to no matter how much money you spent on those pixels. 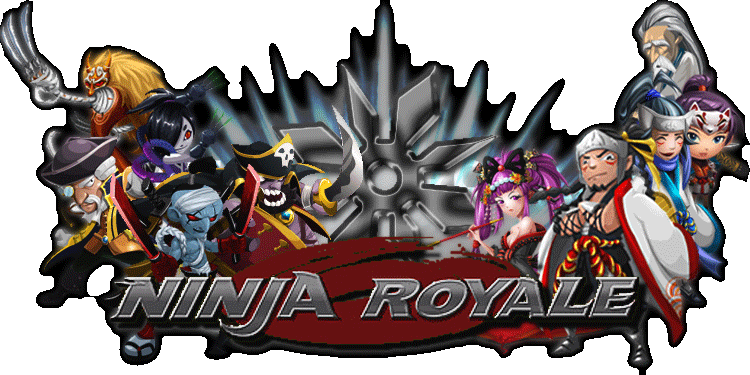 A Lot of Ninjas don't seem to understand that the Ninja Royale events are over. 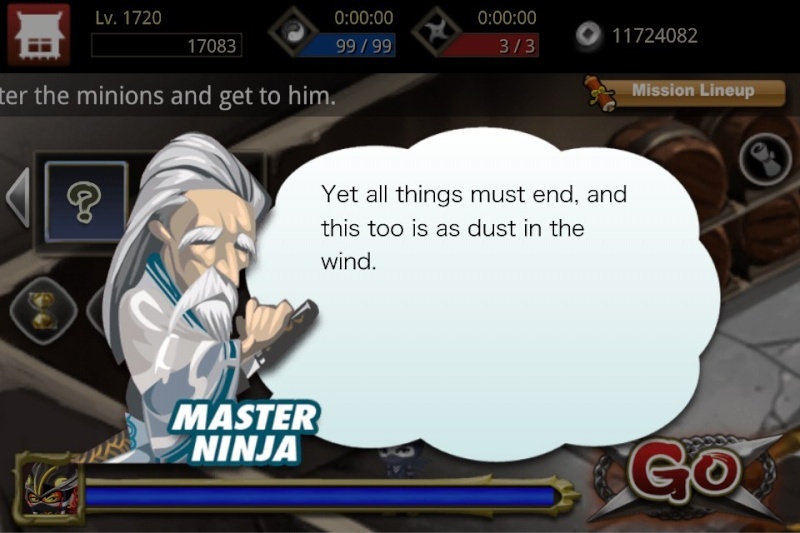 If you were a good ninja and played the last event, "End of Innocence", and beat the Stage 16 Boss. You were given a message by the Master. Events are over Ninjas. And in case you don't know what the word "End" means. Here are two meanings as noun and verb. a final part of something, esp. a period of time, an activity, or a story. "the end of Ninja Royale"
come or bring to a final point; finish. "when Ninja Royale ended, everyone went insane"
Good Luck and Peace to all the Ninjas of Ninja Royale. Officially inviting you over to Epic Heroes by Locojoy Shea1219. I am restarting the NR clan in there along with some new friends I gathered from playing other games this past year.